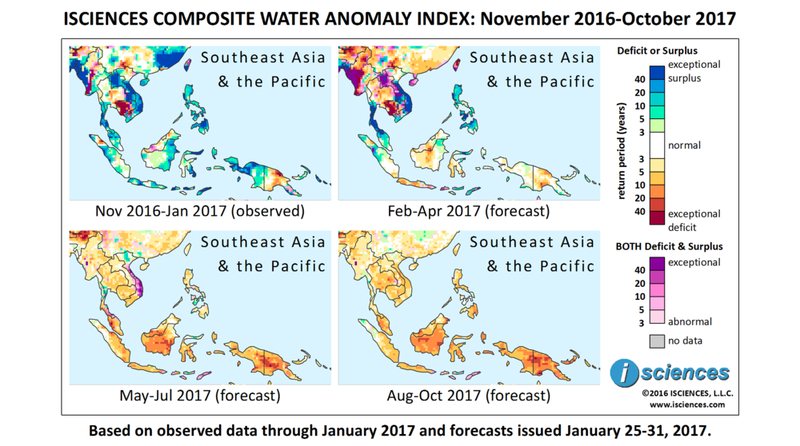 As seen in the 12-month map (below), exceptional water deficits are forecast for Cambodia and moderate to extreme deficits are forecast for Borneo and Papua New Guinea. Surpluses are forecast for western Myanmar, southern Thailand, and central Vietnam, with greatest extent and severity in Vietnam. While the rainy season has helped to alleviate effects of a 2-year drought in many parts of Cambodia, the northwest province of Banteay Meanchey remains hard-hit. Water shortages have left 2,000 families with no alternative but to purchase water for cooking, cleaning, and bathing, and farmers in the region will forgo planting crops for the third year in a row, electing to preserve water for people and livestock. Thailand's government has approved 35.43 billion baht (US$1 billion) in aid to 200,000 farmers in the south who were affected by recent flooding. Nearly two-thirds of the country's rubber is grown in the southern region and output is expected to decline by 7.6 percent. The US Agency for International Development (USAID) has responded with $500,000 for disaster risk reduction activities to help schools and communities in Thailand prepare, in addition to $100,000 granted in January for immediate flood assistance. Heavy rains in Vietnam's Mekong Delta have damaged ripening winter-spring rice and fruit crops and have delayed the salt harvest. Salt prices are up nearly 250 percent over last year. But even as they battle unseasonable rain damage, Mekong communities have been advised to prepare for the 2017 dry season. Natural disasters strip between 1 and 1.5 percent from Vietnam's gross domestic product every year, according to The World Bank. Thirteen people died in Bali, Indonesia when torrential rains triggered mudslides. Flooding was also reported in Central Java, where 4,930 people were evacuated and floodwaters reached 30 to 150 centimeters (12 to 59 inches), affecting approximately 1,500 houses and cutting off some main access roads. January flooding in the Philippines displaced 334,000 people, killed 9, and damaged more than 1,300 homes. As many as 178,000 people remain displaced. The 3-month maps (below) show the evolving conditions in more detail. Noting the predominance of blue/green in observed conditions through January and yellow/orange in forecast conditions May through October, the map progression clearly indicates that the region is beginning to transition from surplus to deficit. For the next three months – February through April – surpluses are forecast for Vietnam, the Malay Peninsula, the Philippines, and North Sumatra, Indonesia. These surpluses may be exceptional in central Vietnam, southern Thailand, and pockets of the Philippines. Both deficits and surpluses are forecast for Laos. Exceptional deficits will persist in Cambodia, and deficits will continue to emerge in northern Thailand while exceptional surpluses persist in the south. Deficits will also emerge in Myanmar, and as the transition occurs both exceptional deficits and surpluses are forecast in western Myanmar. Java is expected to transition from surplus to deficit. Deficits will emerge in central Borneo and will persist in Papua New Guinea, though of slightly reduced extent and severity. The May through July map shows the near-absence of surplus as much of the region completes the transition to deficit conditions of varying intensity. Vietnam will remain in transition: Some surpluses will emerge in the north, both deficits and surpluses are forecast in central regions, and moderate deficits will emerge in the south. Relatively mild deficits are forecast for the remainder of Southeast Asia, with the exception of the Malay Peninsula where moderate to extreme deficits are predicted. This pattern of more severe deficits is also apparent in the forecast for Malaysian Borneo, Indonesia, and New Guinea. Severe to extreme deficits are forecast for most of the island of Borneo and for the island of New Guinea. Primarily moderate deficits are expected in the southern two-thirds of Sumatra, Java, and much of Sulawesi. The forecast for the latter three months – August through October – indicates that deficits will continue to emerge throughout the region, which may be more intense in Malaysia, Indonesia, and New Guinea.